Published: May 2, 2015 at 06:56 p.m. Updated: May 2, 2015 at 09:53 p.m. The NFL draft's return to Chicago got a thumbs-up -- and, after all that hype, Tennessee finally traded down. OK, so maybe the Titans waited a day to do it. On Day 1, of course, the team stuck with Marcus Mariota despite the fact they likely could have received multiple first-round picks, players and probably a sweet chuck wagon, to boot, in exchange for the second overall pick. 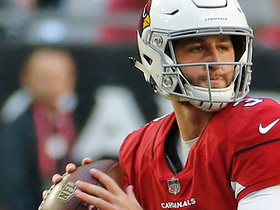 Will the Titans be glad they went with the quarterback come Week 1, when they open the season at Jameis Winston's Tampa Bay Buccaneers? That remains to be seen. But then, the same could be said of all the picks made over the past three days. Let's get real: Assessing the quality of a team's draft class takes time. The accepted span used to be three years, although with the player movement and short coaching tenures that have come with the salary-cap era, perhaps a decent report can be produced after two seasons. Making judgments an hour after the draft is a bit trickier, but we'll do our best. 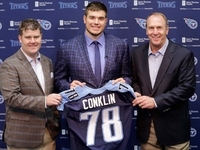 What follows is an off-the-cuff eval of what we saw league-wide, spotlighting the seemingly smart moves and questionable decisions of the 2015 NFL Draft. While, again, we should provide these teams and players with some time, we can say today that a handful of organizations did a better job filling needs than others. And some picks -- like the one that turned a 311-pound kid from Hobart into the first Division III player to be drafted in 19 years -- made the whole experience fun. So without further ado, let's look at the best and most worrisome picks. 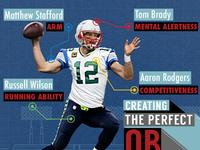 Feel free to share your take ... @HarrisonNFL is the place. 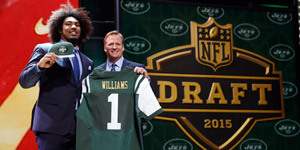 Leonard Williams, DE, drafted sixth overall by the New York Jets. I freaking loved this pick. Was the defensive line already a strength for the Jets? Uh, yep. Does it matter? No. New York wasn't going to get a quarterback unless it moved up, and frankly, Gang Green needs to give Geno Smith a longer look, anyway. So the Jets took arguably the very best player on the board. This isn't unprecedented; Minnesota had two 1,000-yard receivers in Cris Carter and Jake Reed in 1998, but that didn't stop the Vikings from scooping up Randy Moss with the 21st overall pick. Going BPA will never go out of style. a) He should eventually replace Chad Greenway outside, teaming with former UCLA teammate Anthony Barr. If Kendricks packs on some pounds, he could, in theory, play over Audie Cole at MLB. b) Putting college teammates together in the linebacker corps should help breed continuity, which is never a bad thing. c) It would have been a bit too Captain Obvious to solely list Collins, the round's top pick. DeAndre Smelter, WR, drafted 132nd overall by the San Francisco 49ers and Marcus Hardison, DE, drafted 135th overall by the Cincinnati Bengals (tie). Sometimes, teams have to take a chance on a player's upside -- by drafting him two rounds early. That was the case with Smelter, who injured his ACL in December. The Niners have Anquan Boldin and Torrey Smith, meaning they don't need Smelter right away. To paraphrase Bill Walsh, If he helps your football team, it doesn't matter (if you take him early). Of course, the club took that approach with running back Marcus Lattimore two years ago, and it didn't work out. Still, I like the upside with Smelter. As for Hardison, I heard former colleague Pat Kirwan bang the table for him on Sirius XM radio. This guy put up 10 sacks last year. Cincy needs sacks. First round: Melvin Gordon, RB, drafted 15th overall by the San Diego Chargers. It was cool to see two running backs go in the first round, especially with the Chargers trading up slightly to snag Gordon. Todd Gurley -- who went to the Rams at No. 10 -- might look more impressive, but the acquisition of Gordon should really hit the spot for Philip Rivers and Co.
Second round: Ali Marpet, C, drafted 61st overall by the Tampa Bay Buccaneers. How do you not like the selection of Marpet, the first player taken out of Hobart since 1948? NFL.com draft guru Daniel Jeremiah mentioned that this Division III stud acquitted himself just fine when playing with the big boys at the Senior Bowl. Third round: Lorenzo Mauldin, OLB, drafted 82nd overall by the New York Jets. Will he ever be a Pro Bowler? Maybe not. But every team needs high-character guys who won't quit. Given how strong New York is in the front seven, Mauldin doesn't have to be the man. On a different note, Mauldin grew up in 16 foster homes. So there will be approximately zero NFL people not rooting for him. 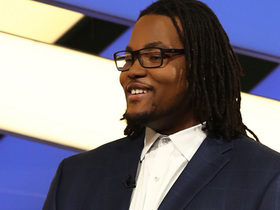 Fourth round: T.J. Clemmings, OT, drafted 110th overall by the Minnesota Vikings. A former team captain and second-team All-American, Clemmings was arguably the highest-rated player available in the fourth round. Always nice to get a second-round-caliber talent on Day 3. Fifth round: Kyle Emanuel, OLB, drafted 153rd overall by the San Diego Chargers. San Diego grabbed itself another hitter to team with Denzel Perryman at linebacker. My colleague Daniel Jeremiah thought those two were among the hardest hitters in the draft. Emanuel should be impactful on special teams. Sixth round: Randall Telfer, TE, drafted 198th overall by the Cleveland Browns. Cleveland is going to run the rock this year with Isaiah Crowell, Terrance West and Duke Johnson. So it made sense to get a big blocking tight end like Telfer. 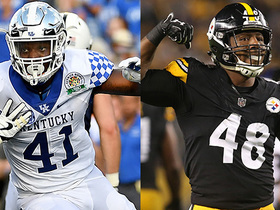 Seventh round: Ifo Ekpre-Olomu, CB, drafted 241st overall by the Cleveland Browns, Geoff Swaim, TE, drafted 246th overall by the Dallas Cowboys and Xzavier Dickson, OLB, drafted 253rd overall by the New England Patriots. Ekpre-Olomu has tremendous upside. Dallas got a blocker in Swaim -- as if the Cowboys needed help run-blocking. And Dickson, whom our NFL Network analysts lauded for playing hard, was the 11th Patriots selection. Bill Belichick likes acquiring picks, a nod to confidant Jimmy Johnson. 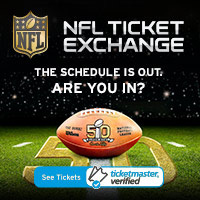 More BPA on Day 1: The Jets weren't the only team to take the best player available in Round 1; the Denver Broncos, Indianapolis Colts and Green Bay Packers all followed suit toward the end of Thursday night. Denver doesn't necessarily need Shane Ray, what with veteran pass rushers Von Miller and DeMarcus Ware on the roster, but the Broncos moved up to get him at No. 23 anyway. How about the Colts drafting Miami receiver Phillip Dorsett 29th overall when they already had T.Y. Hilton, Andre Johnson and Donte Moncrief? Immediately after Indy selected, the Packers took safety Damarious Randall despite already employing Morgan Burnett and Ha Ha Clinton-Dix. That said, the book on Randall is that he's one of the more versatile players in the draft. Maybe he'll be a nickel? Ready to run ... again: Teams were willing to grab a running back early, perhaps as a nod to the success of the Seahawks' ground-based attack. After Gurley and Gordon became the first backs drafted in the first round since 2012 -- with the Chargers, as we discussed above, notably moving up to take Gordon -- six more running backs went on Day 2. Seattle has demonstrated a formula for winning big without throwing the ball around the park, and -- as most things tend to do -- the old-school approach seems to be coming back around. Like Monchhichis. Passing on passers in Round 2: There simply weren't any Derek Carrs to be had in the second round this year. No quarterbacks were taken in the opening stanza of Day 2 for the first time since 2005. If nothing else, it's refreshing that teams didn't reach on signal-callers for a change. Walsh's lasting legacy: No coach, GM, or talent evaluator was quoted more than Bill Walsh -- even I did it! -- through the first two days of the draft. It's amazing that a man who last coached in the NFL in 1988 has such relevance today. New York Jets: They didn't reach on a quarterback, waiting until the fourth round to add Bryce Petty. Defensive end Leonard Williams, meanwhile, was an incredible value buy at sixth overall. Wideout Devin Smith can develop behind Eric Decker and Brandon Marshall. Linebacker Lorenzo Mauldin fortifies an intimidating front seven. The only thing shorter than these sentences are the yards per carry opposing running backs will get. I wouldn't anticipate much from Petty this year. If Geno Smith falters, Ryan Fitzpatrick, and not the rookie, will be driving the bus. Heck, the Jets will only need to score 17 points per game to win this year anyway. Kansas City Chiefs: Kansas City performed as well as any organization in filling out roster needs. Marcus Peters might be as solid as any cornerback in the draft. After the first round, the Chiefs found themselves the interior lineman they needed in Mitch Morse (49th overall, Round 2), then a wideout in Chris Conley (76th overall, Round 3) to couple with Jeremy Maclin. Could Kansas City have drafted a receiver earlier? Sure. But Andy Reid walked away with a cornerback, receiver, center, inside linebacker and second tight end. Tennessee Titans: I initially wanted to see Tennessee trade down in the first round, but it's becoming increasingly difficult not to like Marcus Mariota. Then, in Round 2, the club picked up extra selections from the Giants before acquiring a first-round-caliber talent in receiver Dorial Green-Beckham. Kid QB, meet your new toy. Would have liked Tennessee to hit defense harder, but the Titans had too many needs and too little picks. They also might have drafted offensive lineman Jeremiah Poutasi and defensive tackle Angelo Blackson a bit early. Kudos for picking the great white buffalo of football positions, fullback Jalston Fowler (in the fourth round). Tennessee also landed a four-year starter in center Andy Gallik. PLUS THESE THREE: Also felt the Minnesota Vikings and Baltimore Ravens put together solid college grabs. Trae Waynes joins an already young, talented secondary in Minnesota; I liked the Vikes' first (Waynes), second (Kendricks) and fourth (Clemmings) picks. And per the usual, Ravens general manager Ozzie Newsome pulled some nice pieces out of the pyle for coach John Harbaugh's Lego set. Mayock was all over Carl Davis (third round), a talented defensive tackle that helps retool the Haloti Ngata-less front. One other? Give me the Jacksonville Jaguars. If running back T.J. Yeldon (second round) pans out, look out. Carolina Panthers: If Shaq Thompson puts on a little bulk and can cover, the Panthers should be OK, but it seems like most draftniks agree he's a "tweener," hovering between linebacker and safety. Our Mike Mayock placed the Panthers' first-round pick in the second or third round. 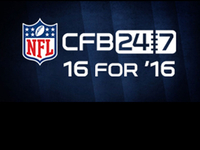 Devin Funchess might be another in-between guy, as in, he's either a tight end or a really big (6-foot-4, 232 pounds) wide receiver. Was it worth trading up 16 spots to land the huge wideout (someone who could be Kelvin Benjamin 2.0)? Perhaps, but the cost -- a third- and a sixth-round pick -- was not insignificant. 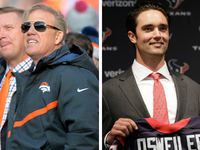 Denver Broncos: Again, going BPA is generally not a bad thing. But the selection of Shane Ray carries enough risk -- he'd likely fallen off or down many clubs' boards due to some off-the-field issues -- and came at a steep enough price (the 23rd overall pick) to cause some concern. As part of the swap to secure Ray, Denver also sacrificed a 2015 fifth-round pick, 2016 fifth-round pick and a viable player on the offensive line in Manny Ramirez. The book on second-round tackle Ty Sambrailo is that he has to add strength. I liked the pick of center Max Garcia in the fourth round. Buffalo Bills: The Bills, of course, didn't have a first-round pick, having given it up to land Sammy Watkins at last year's draft. The player they took when they finally got on the clock -- cornerback Ronald Darby -- does not fill a primary need; whether he was the top corner left is also debatable. Guard John Miller's former head coach at Louisville, Charlie Strong, said on NFL Network that "he could get a lot better." That's not necessarily a bad thing, and Miller's versatility could be Bonus City when injuries strike. Ultimately, though, these picks felt like reaches. Dallas Cowboys: OK, so first-round pick Byron Jones can jump out of the gym ... let's just hope the defensive back can cover better than Morris Claiborne. Taking pass rusher Randy Gregory in the second round represented the biggest risk of the draft. Defensive coordinator Rod Marinelli has been known as a front-seven whisperer, so maybe this was the appropriate landing spot for Gregory. Grabbing linebacker Damien Wilson out of Minnesota in the fourth round filled a depth need, especially with concerns about Sean Lee's health or a potential regression by Rolando McClain. San Diego Chargers: In need of a consistent running game, the Bolts traded up to get the most talented back they've had since him. As for second-round choice Denzel Perryman, well, he was referred to by an AFC director of scouting in our draft profile as a "badass." If the second-round pick from 2013, Manti Te'o, takes a step forward (with a healthy foot), there will be a nice set of linebackers playing (somewhere) in SoCal. 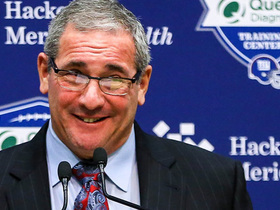 Adding Emanuel and Perryman will change the vibe of coordinator John Pagano's defense. The Chargers took a chance on two athletes in cornerback Craig Mager (third round) and defensive tackle Darius Philon (sixth round), while Emanuel was an FCS guy. So there was plenty of risk here. Oakland Raiders: The pick of receiver Amari Cooper reminded me that the Raiders drafted well last year, too. On the other side, there is concern about defensive tackle Mario Edwards Jr. (second round) regarding his weight discipline. (Nick Fairley, anyone?) Did the team need tight end Clive Walford (third round)?